Any host that reads a template file (or mesh file in MeshConfig terminology) is considered an agent. Agent hosts that upgrade to 4.1 will automatically upgrade to pSConfig and no further action is required by the host administrator. All configuration files will be migrated and the old software will be removed automatically. All agents are capable of reading the old MeshConfig JSON format, so your old mesh files you are pointing at will continue to work even once you have upgraded to the pSConfig agent. This section provides advanced details for those interested in the upgrade process. You DO NOT need to run any of the commands in this section, all the work is done automatically on upgrade. It translates the file /etc/perfsonar/meshconfig-agent.conf to the new format supported by the agent and stores the result in etc/perfsonar/psconfig/pscheduler-agent.json. This only runs if /etc/perfsonar/meshconfig-agent.conf exists and after it is complete, a backup is created at /etc/perfsonar/meshconfig-agent.conf.DATETIME where DATETIME is a timestamp of when it was moved. It moves the contents of /etc/perfsonar/meshconfig-agent-tasks.conf to /var/lib/perfsonar/toolkit/gui-tasks.conf. Any tasks generated from remote mesh files are removed since they will presumably be recreated when the new pSConfig agent runs and all tasks are no longer stored in a single file. Any global archives are moved to the /etc/perfsonar/psconfig/archived.d/ include directory. It then translates the results and stores them in /etc/perfsonar/psconfig/pscheduler.d/toolkit-webui.json. These two files are required by the Toolkit GUI since it still internally represents the tasks in the old format and translates upon save. A backup is created at /etc/perfsonar/meshconfig-agent-tasks.conf.DATETIME where DATETIME is a timestamp of when it was moved. The client_uuid and psc_tracker files are moved from /var/lib/perfsonar/meshconfig to /var/lib/perfsonar/psconfig. The output of this command including any errors can be found in /var/log/perfsonar/psconfig-pscheduler-migrate.log. 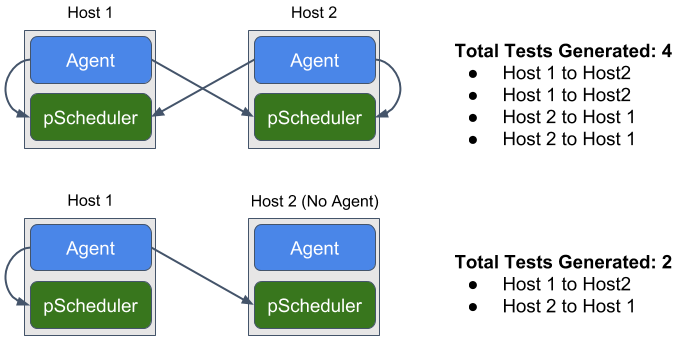 See Running the pSConfig pScheduler Agent for more information on using the pSConfig pScheduler agent and the features it provides. This command has one task which is to convert /etc/perfsonar/meshconfig-guiagent.conf to the new format supported by the agent and stores the results in /etc/perfsonar/psconfig/maddash-agent.json. The output of this command including any errors can be found in /var/log/perfsonar/psconfig-maddash-migrate.log. See Running the pSConfig MaDDash Agent for more information on using the pSConfig MaDDash agent and the features it provides. Once moving to the new agent, if you are pointing at an old MeshConfig file using force_bidirectional, then how your dashboard is displayed will change from how it looked prior to the upgrade. See Special Notes on force_bidirectional and Changes to MaDDash Display for more details. The current set of agents support both the old MeshConfig JSON format and the new pSConfig JSON format, so there is no immediate requirement to update your old mesh files. In fact, if you expect some agents will not upgrade right away and be running MeshConfig then your only option is to use the old forma for those old agents. You can choose to maintain both formats if you so desire, or you can just maintain the old MeshConfig format until all agents have upgraded. Run psconfig translate --help for a full list of options. The command converts the old MeshConfig JSON at the file path or URL specified by OLD_JSON_FILE and converts it to the new format that it stores in NEW_JSON_FILE. Note that it does NOT support the old Apache MeshConfig format, the file MUST be converted to the MeshConfig JSON format first. Once you have your converted template see Publishing a pSConfig Template for more details on publishing the new template. Also see Introduction to pSConfig Templates for more information on working with templates. Note that in the top pair, each agent requests the test in both directions. This results in a total of four tests with each direction being run twice. In the bottom case, only the first host requests both tests since the agent knows the remote side does not have its own agent as indicated by the no_agent property in the mesh file. Note that the no_agent is the main driver for it requesting both directions, not force_bidirectional. Each direction is just run once and there are no duplicate tests. Note that in the top pair, each agent requests the test where it is the source and thus we just get one copy of each test and no duplicate copy. The second host pair is unaffected by the force_bidirectional change since only the first host has an agent, but it still manages to request both directions of the test. The important takeaway here is that with force_bidirectional off we still get results in both directions, we just eliminate unnecessary duplicates. The diagram above highlights a crucial fact: If you are running a disjoint mesh using force_bidirectional in 4.0 or sooner, half you tests are not even displaying. This is not a bug as much of a fact that the box would need to be split four ways to show everything, which would not be readable. Grids for groups of type mesh are whole boxes (no split) with the row being the source and the column being the destination. Grids for groups of type disjoint are still split with the top being the forward direction and the bottom being the reverse. If you want translation to convert force_bidriectional to two task objects with scheduled-by set then give psconfig translate the --use-force-bidirectional option. Just be sure you know what you are doing and are not creating duplicate tests you don’t need. © Copyright 2018, perfSONAR Project. Created using Sphinx 1.3.1.